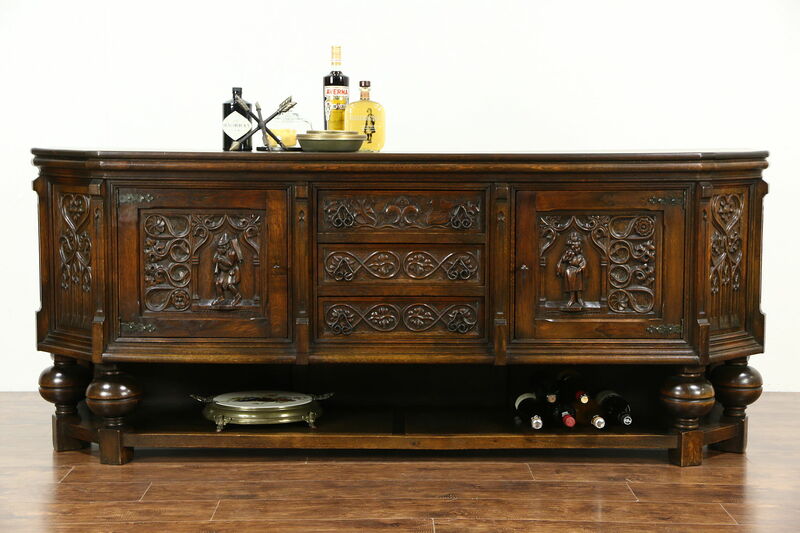 A sideboard, server, hall console or credenza was hand carved in Holland about 1915 in the Gothic manner. Deeply sculpted figures include a man playing a bagpipe and a woman carrying a child. Gothic tracery and "linenfold" panels are masterful. The top has been revarnished for durability, the base has an original finish is very fine condition. Waxed and buffed, all that is needed to maintain the luster is an occasional wipe with a soft dry cloth. There are shrinkage separations from age, see photos. Wrought iron hardware is original, doors have working locks and keys. Drawers have hand cut dovetail joints on this Dutch antique furniture. Dimensions are 85 1/2" wide, 22" deep and 35 1/2" tall.